The word telephone comes from two Greek words, tele, meaning "distant," and phone, meaning "sound." Thus, a telephone is a device for carrying sounds over long distances. Many children are familiar with toy telephones that can be made with two tin cans joined by a taunt string or thin wire. When one person speaks into one can, sound vibrations are carried along the string or wire from the speaker's can to the listener's can. If the listener then places his or her ear next to the receiving can, the sound vibrations are converted back to an audible signal. The first working telephone appears to have been invented by German inventor Johann Philipp Reis (1834–1874) in 1863. 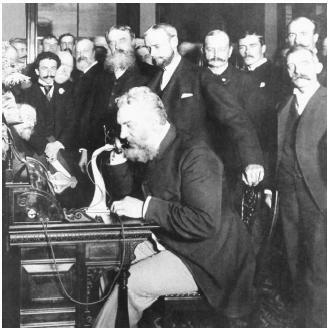 Reis constructed his telephone simply as a scientific toy, however, to demonstrate the nature of sound. He never made any attempt to convert the instrument to commercial use. The first operational telephone was patented and produced in the United States in 1876 by American inventor Alexander Graham Bell (1847–1922). In a quirk of fate, American inventor Elisha Gray (1835–1901) filed his patent for a telephone on February 14,1876, only two hours after Bell had filed his own patent for an essentially identical device. That two-hour difference was sufficient for Bell to receive credit as being the inventor of the telephone, although Gray deserves equal credit. A telephone consists of four basic parts: a source of electrical current, such as a battery; conducting wires, usually made of copper; a transmitter; and a receiver. The transmitter consists of the mouthpiece into which a person speaks when placing a telephone call. The transmitter has a thin metal disk called a diaphragm inside it. Behind the diaphragm is a container that holds granules of carbon. When a person speaks into the transmitter, the diaphragm begins to vibrate. This vibration forces carbon granules into contact with each other, which varies the electrical resistance. An electric current from the source flows through the granules and into the external circuit. The form of the current that flows out of the transmitter depends on the kinds of sound spoken into the transmitter. A loud sound presses the carbon granules together more tightly, causing the electrical resistance to drop, and a stronger electric current is produced. A quiet sound produces a weaker current. The tone of the speaker's voice also is reflected in the kind of sound waves produced and, therefore, on the kind of electric current that is created. The electric current sent out across the telephone lines, then, is a copy of the sounds made by the person's voice. At the receiving end of the telephone line, this process is repeated in reverse order. Electric current flows into an electromagnet that pulls on the diaphragm in the receiver. The strength and nature of the electric current determines how strongly the diaphragm is pulled back and forth. As the diaphragm is pulled by the electric current, it sets up vibrations that can be detected as sound waves. Those sound waves are identical to the ones originally sent out through the transmitter. The system described above requires wires to carry electrical signals from one telephone to another. As telephone usage became popular in the early part of the twentieth century, the air above urban areas became clogged with mazes of telephone wire systems. Eventually, many of these systems were brought together into large cables and buried underground. The 1970s saw the first widespread use of wireless telephone systems in the United States. A wireless telephone system is one in which the electrical signals produced by a telephone transmitter are attached to a radio signal, similar to the one used to transmit radio broadcasts. Those radio signals can then be transmitted from one tower to another, without the need for wires. Cordless, mobile, and cellular telephones perform all the same functions as conventional telephones but use radio waves instead of wires. The convenience and efficiency of wireless telephone communication is the reason behind the impressive growth of this service. In 1984, there were approximately 90,000 cellular telephone subscribers in the United States. By 1990, the number of subscribers had reached 4.4 million. And by the beginning of the twenty-first century, that number had ballooned to more than 13 million. The inevitable future expansion of cellular telephone communication on a global scale will be based on employing low-altitude, low-weight satellites. At present, voice communication and data communication exist separately. As technologies become more advanced, the best of both worlds will be integrated into a multimedia telecommunications network. Multimedia will enable people to combine any media they need to send, receive, or share information in the form of speech, music, messages, text, data, images, video, animation, or even varieties of virtual reality. The emerging capabilities offered by a unified, intelligent telecommunications network will gradually transform the way people interact, work, and learn. this is very interesting && it would have very amazing to understand how he made it. I must commend your effort, nice work done here, i got all the information i needed in my reseacrh from the exact above is really good. I have found an item in my loft which i believe is the internal workings of an early telephone. Could anyone identify it for me if i post a picture"